Every year at the SIGGRAPH computer graphics show you will see the latest, most incredible advances in computer animation. Films rendered with $80,000 Pixar animation computers, TV commercials created with $15-million Cray XMP supercomputers, and animations designed on microcomputers-like the Atari ST. Welcome to the world of desktop video. The ST is probably the least-expensive animation computer available today, but with the software that's available now it's a realistic alternative to animation workstations costing many times as much. For a fraction of the cost, you can create full-length animated video productions from your desk! The ST'S resolution (320 x 200 in low-res color) isn't really a problem in video animation, since a standard television does little better The major limitation of the Atari is its lack of colors. With only 16 simultaneous colors from a palette of 512, the ST is very limited compared to computers that can provide 256 colors simultaneously from a palette of 16 million. The three animation programs for the ST are Make It Move (from MichTron), Animator ST (from Aegis) and the Cyber Family (from Antic). Each one lets you create animations a frame at a time or automatically. Each also includes an animation player program that you can freely distribute, so people who don't own the animation programs can still watch your creations on their own STs. Also, none of these programs is copy-protected. At $49.95, Make It Move is the least expensive of the ST animation packages. It consists of two main programs: OBJECTS.PRG and SCRIPT.PRG. The OBJECTS program is used to define objects - rectangular cutouts from NEOchrome or DEGAS pictures- for later use within an animation. The SCRIPT program manipulates the objects and the flow and timing of animation events. Both programs work only in low resolution. 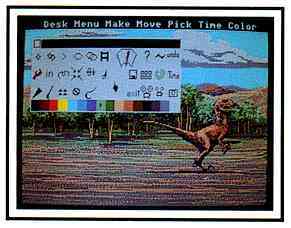 In order to use Make It Move, you must have a paint program that can generate either DEGAS or NEOchrome format low-resolution pictures. 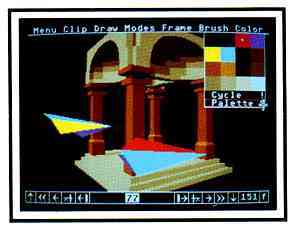 (That means most popular ST paint programs, including DEGAS Elite, NEOchrome, and even Flicker from the Summer 1987 START.) You create the background pictures and objects using the paint program. then import them into Make It Move using the OBJECTS program. Make It Move is essentially a superslideshow program with some cel animation facilities. A typical script will load in one or more background pictures and objects, then animate the objects over the background. Background pictures can be switched using a wide variety of cuts, fades, wipes and dissolves. in fact, Make It Move is the only animation program with a sophisticated array of slideshow effects in addition to cel animation. Make It Move is not well suited to moving anything but static objects (objects with no internal animation) and it's limited to moving them in a two-dimensional plane. However, the animation facilities it does provide perform fairly well. An interesting cel effect is the zoom facility, which allows an object to grow or shrink onto the screen. Although it's frustrating to have to repeatedly run up to three different programs (paint, OBJECTS, and SCRIPT) in order to get an animation going, most of your time will be spent orchestrating the animation in the SCRiPT program. The SCRIPT user interface is extremely simple and a bit garish: every script event, whether loading in an object file or dissolving between two backgrounds, is shown as a giant purple and pink icon. These icons appear in a non-GEM window and show the sequence of events. The remainder of the screen contains rows of buttons allowing you to select parameters and events. Granted, the SCRIPT screen is pretty, but on the whole I found the user-interface more flashy than helpful. The Make It Move documentation is less than 30 pages, with only a few screen shots. The manual barely covers the basics of the program. 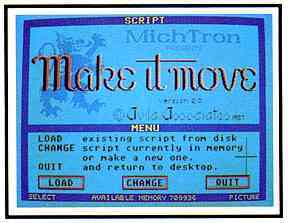 However, to the designer's credit, there are five tutorials in Make It Move animation form. These animation files, when viewed, will actually demonstrate using the programs. In addition, the tutorial scripts double as sample files so you can learn from the techniques. With its cel and slideshow effects, Make It Move is best suited for developing product demos and non-interactive educational videos. The results are not spectacular, but they do the job. Animator ST was the first significant animation program released for the Atari ST Boasting a robust combination of metamorphic. cel and cyclic animation features, Animator ST is an excellent animation package. Animator ST comes with a well-written spiral-bound manual along with some sample animations and example artwork. The program requires only 512K to run and works in low-resolution. The cel animation features of Animator ST allow you to move bitmap images (cutouts from NEOchrome or DEGAS pictures) around the screen the way you can with Make It Move, and the cyclic animation features let you cycle the screen colors. But the most powerful aspect of Animator ST is its metamorphic animation capabilities. You can create a polygon, such as a star, a triangle or a jagged-edged abstraction, by clicking and dragging out the object's corners. Freeze the object on one key frame, then change its shape by dragging its corners into different directions-making say, a star into a tortuous mountain range. Then click on the play icon and watch the star change smoothly into the mountains. But you're not just limited to moving vertices. You can rotate objects in two or three dimensions, shrink them, move them and change them. The program generates liquid-smooth transitions from one shape to the next. The smooth transitions are achieved through automatic tweening-you create the starting and ending shapes and positions, then your ST computes the intermediate images. This tweening also works (somewhat) with the cel and cyclic animation features. You pick starting and ending points for cel movement and the program worries about getting it from point A to point B; you determine the degree of color cycling and Animator ST takes care of changing one color into the next. Although Animator ST supports some cel animation, it is not well-suited for a lot of such manipulations. The cels are handy but rather limited in their utility and flexibility. If you intend to rely heavily on simple cel animation -bitmaps moving around the screen- then Make It Move would probably be a better choice. However, Animator ST is the only animation program for the ST that supports metamorphic animation, and it is the most complete and well-rounded animation package available for the ST.
1 Relies on picture imported from other ST paint programs for text. 2 Lets you animate blocks of images,although not cut and paste them as with a drawing program. 3 Contains drawing tools for 3D object construction-spin,extrude,etc. 4 Lets you move and copy 3D objects, either wireframe or solid. 5 By flattening 3D objects along one axes, you can manipulate them as if they were 2D. The Cyber Family consists of three different products: Cyber Studio, Cyber Control and Cyber Paint. Cyber Studio is the CAD-3D 2.0 solid modeling program along with the CyberMate animation editor; Cyber Control is a more elaborate animation programming language for the Cyber Studio; and Cyber Paint is a combination paint and animation program. All these programs work together, and each one requires a megabyte of memory-either a 1040 ST. a 520 ST with a memory upgrade. or a Mega. CAD-3D 2.0 lets you create a group of 3-D objects, then move them around in animations. It requires a megabyte or more of RAM, with either a monochrome or color monitor. To create a 3-D object with CAD-3D, you can choose one of the program's standard objects or create one yourself, then rotate, extrude and manipulate the object until it's exactly as you want it. Creating an animation consists of creating 3-D objects, putting the program in RECORD mode, and building the animation a frame at a time by moving the objects, the camera position, light sources, etc. For example, to make a fighter plane do a barrel roll across the screen, you must move the airplane object incrementally along its flight path, rotating it about its fuselage. and possibly modifying the camera position or the degree of zoom. A 60-frame animation requires spreading the full motion over 60 frames, each time gauging the amount of movement needed in a process reminiscent of stop-motion photography. It's a complicated process. CyberMate is a FORTH-like programming language that automates the process of creating CAD-3D animations. Unfortunately, it's not very user-friendly: it's entirely text-based, and the language commands are sometimes confusing and difficult to use. CyberMate does support a large number of functions, including looping, sound effects, and dynamic dissolves, fades and color cycling. It can also create stereo animations that use the StereoTek 3-D glasses for true three-dimensional animations. With Cyber Control, you can automate your Cyber Studio object creation and animation much more easily than with CyberMate. Not only can you construct odd and complex objects based on mathematical formulas, but you can write a program to generate your animations, automatically keeping track of the objects, their positions, the cameras and the light sources. You can write your script, start it running and walk away; Cyber Control will generate and record your animation automatically. Cyber Control is easy to learn; it's similar to BASIC. it's still a programming language, though, and you'll find it a far cry from pointing and clicking. Cyber Control supports floating-point arithmetic expressions as well as logical expressions, variables, one-dimensional arrays, facilities for linking objects into structures for complex interactions, automatic spline (smooth curve) generation, and a full repertoire of commands for controlling CAD-3D functions such as zooming, spinning and object creation. Most of us probably think of computer animation in terms of our favorite video game or the newest demo, and when we think of animation software, we naturally think of using the computer to both create and play back our animations. But now it's practical to save the animation on videotape, using the computer to generate individual frames of animation while recording and editing on tape. Megabytes of animation frames can be merged on videotape to create 30-second demonstrations or half-hour movies. You can later dub digital sound onto the tape, allowing music or voice accompaniment. The most economical route to a video animation workstation is a 520 ST with an RF modulator and a standard home video recorder. An RF modulator lets you use an ordinary TV to show what's on your ST's screen; many newer 520 STs have built-in RF modulators. The total investment, including the computer and software, can he as little as $750. A more sophisticated (yet still reasonably priced) setup consists of a 1040 ST or Mega, an RGB-to-composite converter, and a Sony 8mm video deck. The RGB-to-composite converter converts the ST's color monitor signal into a standard composite video signal that feeds directly into the Sony recorder. Sony's 8mm video recorders are inexpensive and offer extremely clean editing; some models have a remote pause jack that can be used to control the video recorder from the computer. You can put together a system like this for $2,000 or less. Going to video isn't a must, of course; all the ST animation programs work fine without a video recorder. But putting your animations on tape can open up a whole world of new audiences for your creations. Cyber Paint is a paint and effects program that gives you frame-by-frame access to your animations. You can create animations from scratch within Cyber Paint, using a full complement of painting tools (lines, circles, fills, etc.) that help you make incremental changes from one frame to the next. You can also import CAD-3D animations and add highlights and other effects to specific frames or ranges of frames, or you can compile and import Animator ST animations. Cyber Paint works only in low-res, and requires at least one megabyte of memory. When you first run Cyber Paint, it works as a paint program: you can load DEGAS and NEOchrome screens into this frame, or you can use the painting tools to create a picture. When you cut a rectangle from a picture, you can manipulate it by shrinking, enlarging or rotating it on any axis. You can create animations by duplicating an image several times, then making slight changes to each frame, adding lighting or reflections. You can also cut a rectangle from a picture and perform tweening to rotate and paste the cut across an animation. You can load CAD-3D animations into Cyber Paint and modify them frame by frame. You can merge and splice animations with a few points and clicks, and the more memory you have, the longer and more sophisticated the animations can be. Best of all is the ADO F/X menu, which lets you take an already-moving animation sequence, then flip it across the screen. It looks like a movie screen with images projected on it that's flipping and spinning through space. In traditional hand-drawn animation, a professional illustrator paints the characters and animated objects on sheets of clear acetate called cels. Hundreds or thousands of these cel images are drawn, each with slight changes in the characters' motions or expressions. The cels are then assembled in front of a background drawing and photographed, one frame at a rime. When the film is developed and shown at full speed, the small individual motions merge together, and the movement appears smooth. A top animator will usually only draw the key frames-the cels that show critical positions in the animation. Then an assistant (often an apprentice animator) draws the eels that appear between the key frames. For example, the master animator might draw two key frames, one with Mickey Mouse's arm bent at the elbow and one with his arm outstretched. The assistant would draw the intermediate positions between bent and outstretched. Because the assistant is drawing the frames between, this process is called tweening. 2-D: Two-dimensional images have only height and width. They're flat images, like drawings on paper. The computer screen produces two-dimensional displays. 21/2-D: The pseudo-dimension seen in most cartoons: objects are two-dimensional, but on multiple planes, so that some objects can pass in front of or behind others, giving a simple illusion of depth. 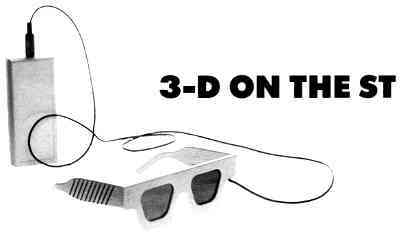 3-D: The real world exists in three-dimensions; objects have a height, width and depth. In three-dimensional animation, objects are represented in three dimensions and are positioned and moved in along three axes; when they're displayed, they are projected onto the two-dimensional plane of the computer screen. Animation frame: A single picture from an animated sequence. When many frames are combined and played back at full speed, you can see the illusion of movement. Cel animation: A type of computer animation that consists of flat objects, usually rectangular cutouts from full pictures (such as DEGAS or NEOchrome pictures). Cyclic animation: A type of computer animation that simulates movement by repeatedly changing the picture's colors through a cycle for example, color cycling in DEGAS or NEOchrome. Cut: A transition in which one image is abruptly replaced with another image. Dissolve: A transition in which one image is replaced, a piece at a time, with corresponding portions of another image. Fade: A transition in which one image gradually changes to black, or changes from black to an image. Metamorphic animation: A type of computer animation in which an object created from points or polygons changes when the points or corners move in relation to each other. Thus, a five-pointed star might unfold itself to change into a mountain range. Overlay: An image that appears in front of all other images. Script: A formal description of the sequence of events in an animation. Splice: To combine two computer animations by following the last frame of one with the first frame of the other. Tweening: The process of automatically computing the intermediate positions between one key frame and the next of an animated object. Underlay: An image that appears behind all other images. Video frame: A single complete picture as shown on a standard television set, which requires 1/60th of a second to show. A video frame is distinct from an animation frame, although the two may be synchronized. Wipe: A transition in which one image is replaced with another gradually, either from side to side (horizontal wipe) or from top to bottom or bottom to top (vertical wipe). Cyber Paint is a spectacular tool, but it's also a memory-eater. With a one-megabyte machine, you'll be hard pressed to create more than seven or eight seconds of full-speed animation entirely in memory You can, however, use the patch tool to edit animations that are larger than available memory by working with smaller chunks of the animation at a time, although it's quirky and slow to work with. 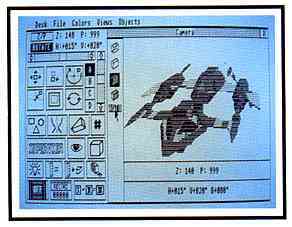 Overall, though, Cyber Paint is the most exciting animation product available for the Atari ST computers. it's fast, fun and instantly gratifying. If you'd like more articles like this, circle 185 on the Reader Service Card. Matthew N. Shelly programs for the Atari ST and writes software documentation. Make It Move $49.95. MichTron, Inc., 576 South Telegraph, Pontiac, Michigan 48053, (313) 334-5700; BBS:(313) 331-5452. Animator ST. $79.95. Aegis Development, 2115 Pico Boulevard, Santa Monica, CA 90405, (213) 392-9972. Cyber Studio (CAD-3D 2.0 and CyberMate), $89.95: Cyber Control, $59.95; Cyber Paint, $69.95. The Catalog, Antic Software, 544 Second Street, San Francisco, CA 94107, (800) 234-7001. If you want to take the next step beyond 3-D (solid modeling) ST graphics, then run down to your friendly Atari dealer and take a look at-and through-the LC Technologies StereoTek glasses. The glasses connect, via cable, to a cartridge plugged into your ST. Their lenses (liquid crystal shutters) flicker on and off 60 times a second (30 for each eye), synchronized to the alternating left eye/right eye views being shown on your ST The effect is startling- true stereo; the illusion of real-world depth into your ST monitor. CAD-3D 2.0, Cyber Control, the educational Genesis Molecular Modeling system, Maps and Legends, the games LCS Wanderer, Shoot-The-Moon, and several others. Additional stereo software (including games) should be released later this year. StereoTek Glasses, $149.95. LC Technologies, a division of Tektronix, P.O. Box 4960, Beaverton, OR 97076. (800) 426-2200.